By Keith Cowing on January 10, 2011 4:06 PM. "One of the strangest space objects ever seen is being scrutinized by the penetrating vision of NASA's Hubble Space Telescope. A mysterious, glowing, green blob of gas is floating in space near a spiral galaxy. Hubble uncovered delicate filaments of gas and a pocket of young star clusters in the giant object, which is the size of our Milky Way galaxy." By Keith Cowing on January 10, 2011 2:12 PM. "NASA's Kepler mission confirmed the discovery of its first rocky planet, named Kepler-10b. Measuring 1.4 times the size of Earth, it is the smallest planet ever discovered outside our solar system. The discovery of this so-called exoplanet is based on more than eight months of data collected by the spacecraft from May 2009 to early January 2010." By Keith Cowing on January 3, 2011 5:59 PM. "An ambitious $1.6 billion spacecraft that would investigate the mysterious force that is apparently accelerating the expansion of the universe -- and search out planets around other stars, to boot -- might have to be postponed for a decade, NASA says, because of cost overruns and mismanagement on a separate project, the James Webb Space Telescope. The news has dismayed many American astronomers, who worry they will wind up playing second fiddle to their European counterparts in what they say is the deepest mystery in the universe." 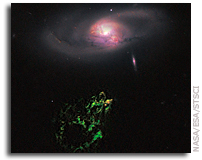 This page is an archive of entries in the Astronomy category from January 2011. Astronomy: December 2010 is the previous archive. Astronomy: February 2011 is the next archive.